The Collegiate Starleague first Fortnite season is a momentous success. Thirty-three - yes, thirty-three - groups have been filled with teams from across North America. Although every group is filled with passionate players building forts and a name for themselves, not everyone can come out on top. 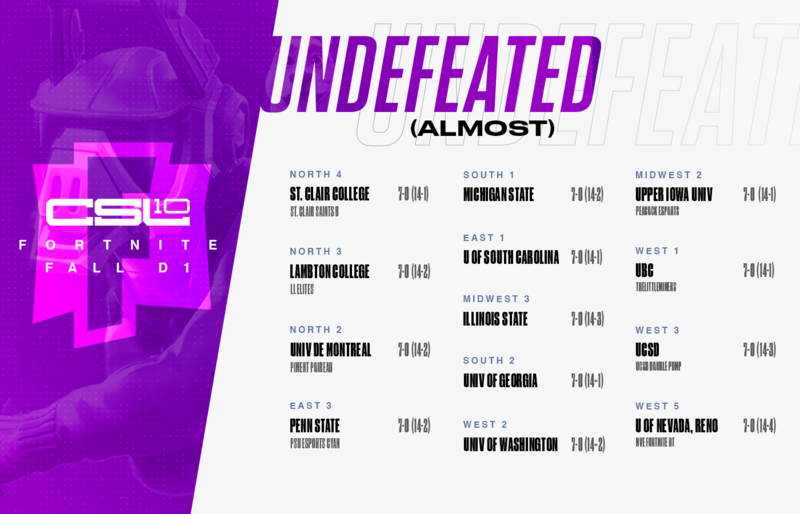 Keeping track of your wood, stone, metal, and ammunition is daunting; keeping track of the Fall Season for competitive collegiate Fortnite is a breeze with the CSL recap. Four schools have asserted their dominance over their competition, finishing the Fall season without losing a match across seven series and boatsting a 14 - 0 record: State University of New York - Stony Brook, Florida International University, Georgia Institute of Technology, and California State Polytechnic University, Pomona. No one in the North will be attending the Fourteen-and-Zero-Club meeting; however, three teams have skillfully secured a 7 - 0 record in the Fall: St. Clair College (14 - 1), Lambton College (14 - 2), and Université de Montréal (14 - 2). In the East, Stony Brook is joined at the top of the food chain by Pennsylvania State University (14 -2) and University of South Carolina (14 - 1). Two of the four undefeated teams hail from the South: FIU and GA TECH, making the South the most dangerous region. University of Georgia’s (14 - 1) single loss to the University of Kentucky (3 - 4 | 8 - 8) has stopped Georgia from joining the two other titans in the South with a perfect 14 - 0 score. No team in the Midwest has managed to procure perfection, but Michigan State University (14 - 2), Illinois State University (14 - 3), and Upper Iowa University (14 - 1) have entered the Winter Break on Santa’s naughty list because of the state they left their competition in. Cal Poly sits atop a throne above their competition in the West. Conveniently and coincidentally, the other three schools who achieved greatness in the West have unique scores which dictate where they sit underneath the champions from Cal Poly. 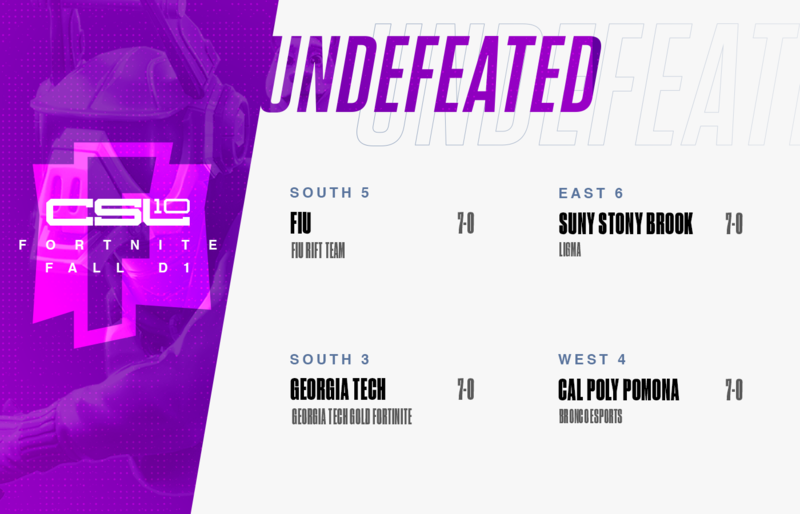 University of British Columbia (14 - 1), University of Washington (14 - 2), University of California, San Diego (14 - 3), and University of Nevada, Reno (14 - 4) have all set the foundation to build their reputation in the first ever collegiate Fortnite competitive season. Keep up to date in the coming competitive Fortnite season by following the Collegiate Star League on Twitter and by watching your favourite teams build a staircase to success on the official CSL Spring standings.